LITTLE ROCK, Ark. -- The Current, the conference newspaper, won two awards, including an Award of Excellence at the 2011 DeRose-Hinkhouse Memorial Awards, sponsored by the Religion Communicators Council. The awards were announced at the organization's annual meeting March 31. 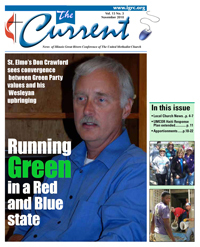 IGRC Director of Communication Ministries Paul Black won top honors among single-issue local or regional newspapers with the November 2010 issue of The Current, which featured the cover story Running Green in a Red and Blue State, a feature on Green Party candidate for lieutenant governor, United Methodist Don Crawford of St. Elmo. The main story included sidebars on all self-identified United Methodists in office and running for office in the November 2010 election. "An effective communications tool with stimulating dialogue," judge Bonnie Reichert of Belmont University in Nashville, Tenn. wrote in evaluating the issue. "The issue had a nice use of color and a nice center spread." The second award, a certificate of merit, was also awarded to Black in the local or regional newspaper category for the newly-designed format of The Current (September through December 2010 issues). "A lively newspaper filled with photos and activities, adding interest to the informative articles," Reichert wrote. "Readers must look forward to each issue." The September 2010 issue marked a change to a more feature story approach to the newspaper as well as publication of a center spread First in Print story that is then published to the web. The DeRose-Hinkhouse Awards are given annually to active members of the Religion Communicators Council (RCC) who demonstrate excellence in religious communications and public relations. The awards are named to honor the late Victor DeRose and the late Paul M. Hinkhouse, leading lithographers in New York City, and longtime friends of the RCC. Both men shared a strong interest in, and concern for, excellence in communications. RCC provides opportunities for religion communicators to learn from each other. Together, RCC members promote excellence in the communication of religious faith and values in the public arena and encourage understanding among religious and faith groups.